Chaparral Gallery Opening Museum, nice pics. The opening of the Chaparral Gallery was kicked off with a forum discussion of the Chaparral history. 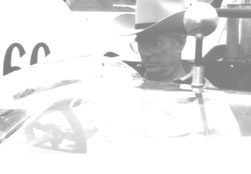 Participating were all the drivers over the years, Franz Weis engine builder and Hall's competitor, friend and legend Dan Gurney. YouTube, Last run of the 2F to museum and all kind of other YouTube Chaparral stuff. YouTube movie: Walk around 2E with Jim Musser. INTERESTING! Interview with Jim Hall by Paul Haney, at The Brian Redman International Challenge at Road America, 2001? Look in the index for Jim Hall, Chaparral and contempories. Nice site. Chaparral 1 history and track test! A blogger about Jim Hall and the cars. Good work. When you enter Midland there is this sign, explaining the name of the town. Interesting. Chaparral Cart Series statistics. For Chaparral look 1979 and further.This is an excellent source. Their own statement: Complete history of Formula 1, CART/IndyCar, IRL, NASCAR, ALMS & Trans-AM, detail results of every single race, huge database of pictures, extensive statistics with cross reference of different series. The ONLY site on the internet that provides all with cross reference. Splendid site. Many, many pictures of CanAm cars, Interserie, FIA Sports cars, Le Mans cars etc. Chevrolet GS2b/Chaparral connection. The pictured 2C is not a 2C but a 2A! Short history, All Chaparral racing results. Short history and some new time pics. Seems to be a real slot race source! Cars, drivers and stats of the '67 CanAm season. Good work! Another HO scale racing site. Look for Chaparral 2D. Nice Chaparral slot racers + story. The 2C is actually a 2A! A mistake often made.